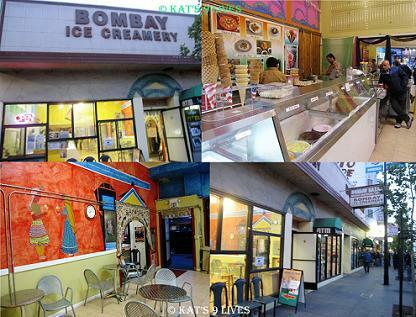 Kat's 9 Lives: Bombay Ice Cream : Rosie-Goodness! Bombay Ice Cream : Rosie-Goodness! What's a girl to do after an extremely long day of line waiting for the SF Street Food Festival? Well continue to eat of course!!! lol Nothing stops me! I went to Farolito for Agua Frescas, Anthony's Cookies for 1 1/2 dozen of fresh baked cookies, Happy Hour Sushi at Tokyo A Go Go, Crepes at Ti Couz, Ice Cream at Bombay Ice Cream, and then dinner at Thai House Express to finish off the night. This is just how I roll! =D I really need to think about investing in antacids in my purse! Since Ms. Lin was able to find a great spot in the Mission District, we didn't really want to give it up! lol We kept trying to find more and more things to do. Across the street I saw Bombay Ice Cream. This trip to SF I have been sick most of the time and hadn't even had the chance to go to my favorite Bi-Rite Creamery. I took this as a sign that I needed to try Bombay Ice Cream since I haven't had any good ice cream this trip. The market adjoined was closed but the ice cream shop was empty. As soon as we walked in a guy approached us to help me order. They have a policy of trying only 2 samples so I had to choose wisely! The guy was super nice and helpful. He ended up giving me 3 samples and was very patient. I ended up ordering a pint with Mango Rose and a little bit of Rose Petal. The mango rose was just the right mix of mango and aromatic flavor of rose. I love the real rose petals in the rose petal ice cream and taste the freshness. They have a lot of unique flavors that blend fragrant spices, flowers, and fruits together. I really crave the delectable mango rose and rose petal ice cream! Wish they were down here so I can stock up in my freezer! =D I've just added a great new ice cream place to my repertoire. apparently they were shut down for health violations @_@ I'm sad to see them gone even if they were probably "unsanitary"
Join Me In Some Foodie Adventures! Kat's 9 Lives: at Your Service! Sports Authority : Want A Deal? Luscious Dumplings Inc. : The Name Says It All! Thermidor : I ♥ Lobster!!!! Seasons 52 : Can Eating Out Be Healthy?